What’s the appeal of whiskey? 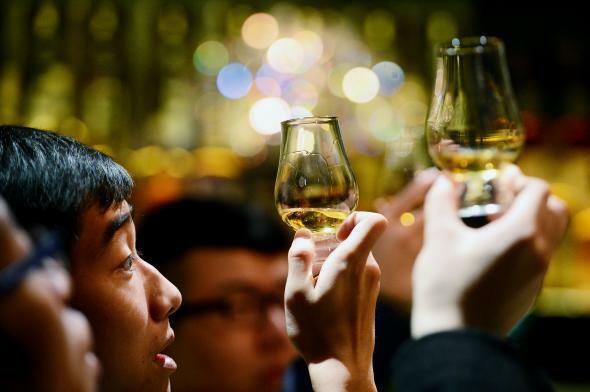 People examine samples inside the Diageo Claive Vidiz Collection, the world’s largest collection of Scotch whisky, on March 19, 2014, in Edinburgh, Scotland. Let’s start with the appeal of any alcoholic beverage: to become intoxicated for little while. However, how you choose to become intoxicated leaves you with a vast range of possibilities. It’s easy not to look much further beyond the already impressive array for different beers and wines that are widely available, so here I’ve listed a few reasons why you may want to give whiskey a try instead. If you are one of the many people around the world who can appreciate a glass of beer, you probably have grown to appreciate the intricate interplay of malts and hops and how they can result in lots of different flavors. Ranging from pale light beers to heavy barrel-aged imperial stouts, beer shows how you can get a lot of flavor variety from a few very simple ingredients. If you’re a little bit like me, when you learned about distilling during a chemistry class, you probably also wondered: “So, if I heat up some beer, can I just extract all the alcohol and make pure alcohol?” Luckily for us, the answer is yes, but although you’re extracting all that alcohol, some of the flavors in the beer would come with the alcohol. Unfortunately, though, if you cook hops for a long time, virtually only the bitterness is kept, and much of the flavor and aroma will get lost. However, if you leave out the hops when you brew your beer, and then distill the beer, you get essentially malt whiskey. So if you like beer, chance is that you’ll like the taste of a good malt whisky. Many whiskey enthusiasts are, like many beer or wine enthusiasts, always looking out to try a new whiskey they haven’t tried before, and like the other aforementioned enthusiasts, they love to talk about all the different kinds of whiskey they tried in the past or would love to try some time in the future. This sounds like something that could be very annoying, and granted, it sometimes is, but more often than not, it’s a good thing. For example, in virtually any bar that has a large whiskey selection, the staff behind the bar are those kind of enthusiasts. Odds are that if you strike a conversation with the bartender and ask her about what her favorite kinds of whiskey are, she’ll be more than willing to share some of that love with you and pour you some for free. Whiskey is being produced in many different countries around the world, each with its own proud, albeit sometimes short, history. For many whiskey drinkers, a big appeal is exactly that amount of variety that is being offered. For example, you could choose to drink a whiskey ranging from very sweet and easy to drink, all the way to very peaty and saline, almost like liquid bacon. It’s quite amazing to experience how small changes to the ingredients, aging process, or even the environment can have such a large effect on the final product. Most big whiskey drinkers do not favor just one type or even one brand. Some might want to focus solely on one specific region or country, but generally, most whiskey enthusiasts collect, and try, a multitude of different whiskeys from across the world. So if you like to collect things, you are in very good company. If you enjoy gambling or playing the stock market, you will find that buying whiskey can be a very lucrative activity. Some (rare) whiskeys, and even more so complete series of whiskeys, can appreciate in value very quickly. For example, a recent Highland Park series release would have set you back about $400 for all four bottles when it came out, but if you still have all bottles in their original package and unopened, the whole series could be sold today for around $1,200—a three-times return over a period of around five years. An example of how serious this kind of business is is the site World Whisky Index, which focuses completely on speculation around whiskey. So even if you decide that you don’t really like to drink the whiskey, it can still be a very attractive item to buy. Let’s be realistic here. Drinking whiskey is a fashionable thing to do. It’s hip, new (small) distillers are popping up all over the world, and old reserves are being tapped into, because the market is hot enough to sell the old casks at a solid profit. It’s a great time to be a whiskey drinker! The number of choices you have is increasing every single day. More likely than not, you noticed the recent surge in popularity of the drink, and it’s one of the reasons you are reading this. To be frank, for a lot of people, the current trendiness of the drink was the initial appeal to give whiskey a try. Many, however, continued drinking it after their initial encounter, as they recognized the various other appeals the drink has, as mentioned before. So give it a try, and choose your next drink wisely. Scotch: Why do you often see rich people drinking Scotch (usually on the rocks or neat), but never beer? Whiskey: Does whiskey aged for many years really taste better? Single malt Scotches: What is an interesting single-malt scotch to bring to a tasting party?